The HTC gallery is a custom job, but stacks photos just like the vanilla Android gallery. The app automatically locates images and videos, no matter where they are stored. You can choose to show/hide camera shots, All photos or All videos. A tap on the Albums dropdown lets you view local or online albums. On the cloud side, you get Facebook, Flickr, Dropbox, Picasa or SkyDrive. Once you pick one of the "stacks" (each representing a folder), you're presented with a grid of the photos. Some files have an icon indicating it's not a still photo but a video instead. You can also mass delete images, but you can't copy/paste images across folders - you'll need a proper file manager for that. There are some basic editing tools - crop, rotate and effects (auto enhance, sepia, vintage, etc.). 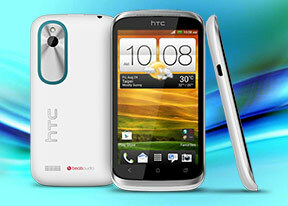 The HTC Desire X supports multi-touch and you can take full advantage of it while browsing your images. You can zoom up to 100% with a simple double tap on the screen. The implementation here is extra smooth too. There's no dedicated video player onboard the HTC Desire X, which means that video files have to be accessed via the Gallery. The video interface offers a view mode toggle (full screen or best fit) and you can scrub through videos. There's a shortcut that lets you adjust screen brightness and another one to take screenshots of videos. Video support on the Desire X was pretty good. It was able to play most AVI, MP4, MKV files we threw at it though it did choke on some old XviD-encoded AVI videos. DivX had problems with audio sync but worked fine with AAC audio. Subtitle support is available, although you have to have a subtitle file in the same directory as the video to be able access the subtitle options. These include the ability to select a subtitle file (if there is more than one in the same directory), as well as adjust the character encoding, which can be useful in getting those non-Latin subtitles to work. The now playing interface is a Cover-Flow-like visualization of the current playlist - you can swipe sideways to skip songs back or forward. You can also opt to view the full playlist if you need to skip more than a few tracks. The Desire X offers the Beats Audio sound enhancement to boost the sonic experience, although at a slightly dumbed-down variant. Gone are all the Beats Audio presets we're used to in other HTC phones, all you're really able to do on the Desire X is toggle it on and off. The lockscreen has a widget that shows the album art and name of the song and artist along with playback controls. You can pause playback or skip tracks directly by pressing the relevant button but you cannot unlock the phone into the full featured Music Player by dragging the widget into the ring. SoundHound is the track recognition of choice for HTC and they've even integrated it into the music player UI. It easily ID's a song from just a short sample. Or you can say the name of the artist and song and SoundHound will find it for you, including lyrics. The HTC Desire X is also equipped with an FM radio, which has a pretty simple interface. It automatically scans the area for the available stations and allows you to mark some of them as favorite. It also supports RDS and allows loudspeaker playback. You can play the sound through the headphones or the loudspeaker, although you need to have a headset plugged in at all times to be used as an antenna. There's no Beats enhancement here though, or a playback control card on the lockscreen. If you have a data connection, you can use TuneIn radio instead of relying on your local FM radio stations. The audio output test was another area, where we noticed a significat difference between the HTC Desire X and the Desire V. The dual-core smartphone not only outperformed its dual-SIM sibling, but it posted some of the most impressive scores we have seen from the company's devices. An active external amplifier lets the Desire X get excellent scores all over the field. There are no weak points to its performance and combined with the above average volume levels, this makes up for a pretty solid showing here. 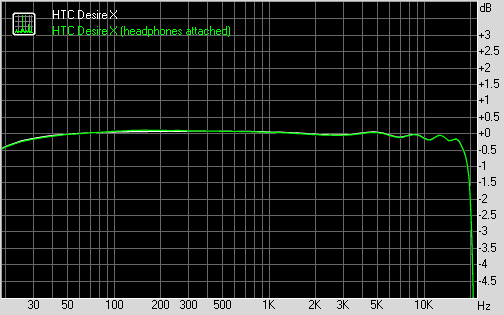 More impressively, there is virtually no degradation when headphones come into play. Some intermodulation distortion creeps in, but that's hardly detectable in anything but lab conditions. Amazingly the stereo crosstalk reading was unaffected and the overall output was certainly among the cleanest we have seen in this scenario.